In my continuing facination with Dremel attachements, I ran across this over the weekend: an attachment that converts your Dremel into a (very small) plunge router. Included in the package is a circle-cutting guide and an edge guide as well. While I’d guess that most of you (like me) already have at least one router, I’d imagine that this would be appropriate for much smaller work than you’d even want to attack with a trim router. And not surprisingly, Dremel’s router attachment seems to have been designed with that kind of use in mind. Note the clear base, which would make it much easier to see what you’re doing in tight spaces. Other features: a locking plunge assembly, a depth guide with English and metric markings, and two depth stops with quick release. 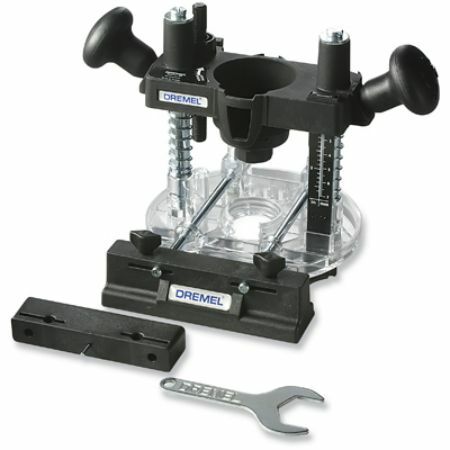 This fits most modern Dremel models, including the 400, 398, 395, 300, 285, and 275. I bought this and immediately returned it. It’s not very stable and the dremel will shift while the bit enters the piece because of it. I also opted for the table version and the piece that holds the dremel is also flimsy on there. Granted I was cutting material like pine and mdf, but maybe those hobbyist that work with balsa or other projects that may not need precesion cuts will benefit from this product. I second Arnold’s observation that the Dremel does indeed shift, and the whole thing is rather flimsy. Used it briefly as a table router (mounted it to the underside of a milk carton) where it worked marginally better. Ultimately shelved it and haven’t touched it since. I love my Lithium Ion Dremel, but hate not having a corded Dremel when I see neat attachments like this that won’t fit. Stewart-MacDonald’s base doesn’t plunge and is a little more money. But, it’s really well built and a pleasure to use. Not a bit of plastic in sight. It’s great for inlay work. I have a fixed router base for my Dremel, but unless I take up making doll house furniture out of veneer and balsa wood it isn’t worth fooling with. I know a lotta people really like Dremels, and I’m glad they find them usefull. But I’ve had one for about twelve years now and it is pretty much useless for anything I need to do. Every couple of years I need to make an itty bitty cut in a tight space in metal, and break out a few cutoff disk. Other than that I find other tools work better. What convinced me to wear safety glasses was a shattered cutoff disk knocking a gouge out of the plastic lense directly in front of my eyeball. I hate this thing. It’s a flimsy POS. Even when every screw is as tight as I can get it without the thing breaking, I found that it’ll still let the bit wander about even when cutting something as soft as pine. Forget having a straight line if there’s a knot or something that affects the density of the material. I like the dremel router table. It’s been good for trimming & rabbeting the edges of plastic sheets. I don’t buy electronics project boxes anymore, and the main reasons for that are the dremel router table and the scrap bin at TAP Plastics. I wouldn’t suggest trying to cut hardwood or metal with it, though. I’ve never used this, but I used a stewmac (see Brad’s comment above) to rout the beveled edge of a guitar pick guard for a guitar I was restoring for a friend. The small agile Dremel router was just the trick for the multi layer plastic pickguard, and it was easier to control the speed on the Dremel to avoid melting the plastic – not to mention the control factor. I have a fixed base which I actually like for just one task: it excels at routing out hinge mortises in cheap fiberboard doors. I’m not much good with a chisel in such wimpy material and arger power tool would shred it. Thanks! !..This is good to know..Since I’ve been searching online for one..Now i can stop!.